The New Village Hall replaced the much smaller Old Village Hall, originally built in 1921 and located in The Street. After many years of fundraising and planning the Old Hall was eventually sold at auction and re-developed. The money raised from the sale was added to grants and donations so that construction could start on the new site in School Lane. The new building was designed to blend with it's rural surroundings and featured an imposing barn-style roof, large car park and landscaped grounds. 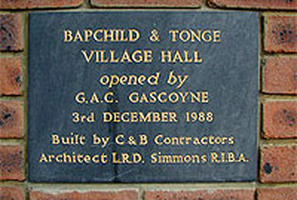 Constructed by local builders C&B Contractors from designs by Architect L Simmons (RIBA) the New Hall was officially opened by Mr G Gasgoyne on 3rd December 1988. The Clock Tower was added in 2000 to mark the Millennium.